a book chick: "Grain Brain"
my take: A few years ago I went gluten-free. I hadn't been feeling great - bloaty, foggy headed, fatigued. I soon felt much better and have been mostly gluten-free ever since. So that's not exactly what drew me to this title. 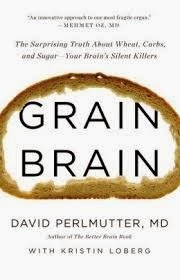 It was the sub-title: "The Surprising Truth About Wheat, Carbs, and Sugar - Your Brain's Silent Killers." Hmm. Although I've dropped wheat, I do love me some carbs and sugar. And, frankly, I love my brain! As a neurologist, Dr. Perlmutter is interested in the causes of Alzheimer's, ADHD, autism, depression and the like. He's a holistic doctor as well as an MD, so I respected his well-rounded approach to health, nutrition, and his passion for preserving brain function. I've been convicted to greatly reduce the amount of sugar I'm eating. That's going to go a lot farther in keeping my wits about me than crossword puzzles. And fighting arthritis and inflammation. Big changes in the kitchen cupboards at my house. Working on getting hubby to read so we're on the same page. If you have pain, auto-immune issues, lethargy, hyper-active children this is a must read. Seriously, as the good doctor says, gluten-free living is free and can't hurt you, unlike many prescription drugs. Potentially, great health and well-being awaits. Try it and you may, I say (from the other good doctor … Seuss).